Add a modern look to any bathroom with this piece from Delta. This single-control faucet adds a classy look to any bathroom project. This item's easy-to-install deck mounted design gives a fresh look to any counter top. This WaterSense certified faucet uses less water but gives you the same clean every time. Brand new style meets all-around use in this beautiful piece from Delta. This single-control faucet adds a classy look to any bathroom project. Its deck mounted design works well with many different sinks and is easy to set up. This WaterSense certified faucet saves water and money, but gives you the same clean. Cassidy Single Hole 1-Handle Low Arc Bathroom Faucet in Chrome with Lever Handle Add a modern look to any bathroom with this piece from Delta. This single-control faucet adds a classy look to any bathroom project. This item's easy-to-install deck mounted design gives a fresh look to any counter top. This WaterSense certified faucet uses less water but gives you the same clean every time. 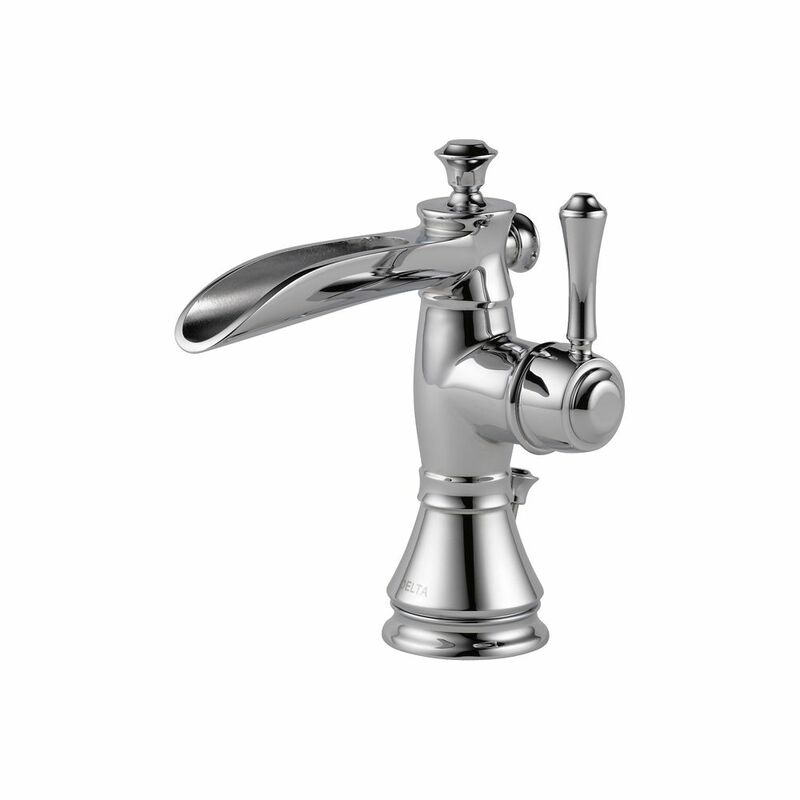 Cassidy Single Hole 1-Handle Low Arc Bathroom Faucet in Chrome with Lever Handle is rated 4.8 out of 5 by 29. Rated 5 out of 5 by Remodelist from Perfect blend of form and function at an incredible price. The way the water comes out of this ... Perfect blend of form and function at an incredible price. The way the water comes out of this faucet is so much more efficient and useful I think all faucets should have the spout design. We installed two of these in polished nickel in a very high end bath reno two years ago and they have performed flawlessly. We planned not use the included pop up in favor of a tap-touch drain stopper, which was a good thing because, like so many of these that pull at an angle out the back, our backsplash wouldn’t have given enough clearance. So measure carefully. We are now moving and our new sinks will be three hole. I have looked for something superior to this and there is nothing so we are back to buy two more. I would rather have the hole-cover plate and this magnificent faucet than use something inferior. The entire Cassidy line is gorgeous in polished nickel and we have just been so pleased with it. Rated 4 out of 5 by RH from The faucet looks great! Just wish the spout was slanted... The faucet looks great! Just wish the spout was slanted a little to allow all the water to drain out. Rated 5 out of 5 by mam160 from Love the look and ease of use for both hot and cold water. Also like that water comes out to midd... Love the look and ease of use for both hot and cold water. Also like that water comes out to middle of sink (water reaches farther than old faucet) makes it easier to was face etc. Even got compliments from the plumber on how nice it looked and functions well. Rated 5 out of 5 by Gwen from I love the faucet it's beautiful now my bathroom look like a awesome hotel. I love the faucet it's beautiful now my bathroom look like a awesome hotel. Rated 5 out of 5 by Pat from Nice looking faucet, easy to use, very smooth, good water... Nice looking faucet, easy to use, very smooth, good water flow. One of the best faucets I've owned for function and form, and reliability. Been using this for a while now, and it's great, exceeds my expectations.